Hey! Hope your all having a good Monday. I’m really happy and I don’t even know why to be quite honest(that’s just me). I decided to post about nails because nothing better than gorgeous nails for Christmas right? 1. Elegant Touch glitter nails: red – Boots. 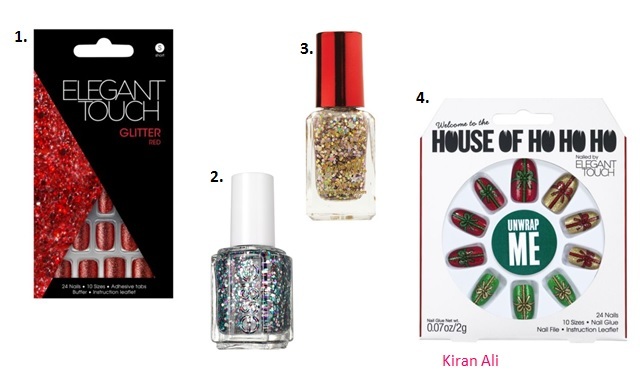 Nothing better than red glittery nails – they are so CHRISTMAS! 2. Essie nail polish jazzy effects – Boots. This has such a lovely shimmer to it – in love. 3. Barry M Christmas edition – Boots. They have made a nail varnish just for Christmas it’s a must have guys!! 4. House of Holland xmas unwrap me – Boots. These are the cutest nails ever the print is adorable. Comment your favourite nail varnish/false nails down below guys. Hope your enjoying your last week at school until Christmas. Thank you so much for everyone reading my lovely readers are increasing day by day. See you all soon – stay sassy.